This page describes GSM Noncombined channel configuration for TS0 and TS1. It covers 51 frame multiframe structure mentioning FCCH,SCH,BCCH,CCCH,SDCCH channel mapping on TS0 and TS1 for both downlink and uplink. As mentioned in GSM Channel types signaling channels SDCCH are not combined with (FCCH+SCH+BCCH+CCCH) on time slot TS0. They are mapped on separate time slot TS1 as shown in the figure. In noncombined case, there are nine CCCH blocks mentioned as CCCH(0) to CCCH(8). If the System information messages (SIs) are more and can not be occupied in BCCH block then first CCCH block i.e. CCCH(0) can also be used for BCCH and SIs are transmitted on the same. In GSM system BS_AG_BLKS_RES parameter is used to determine how many of CCCH blocks are used for AGCH and how many for PCH. This parameter is of 3 bit field and is transmitted on BCCH SI-3. It has range from 0 to 7. Value of 2 indicates 2 blocks are reserved for AGCH and remaining(i.e.7) blocks are for PCH. For more details visit GSM Terminology page. 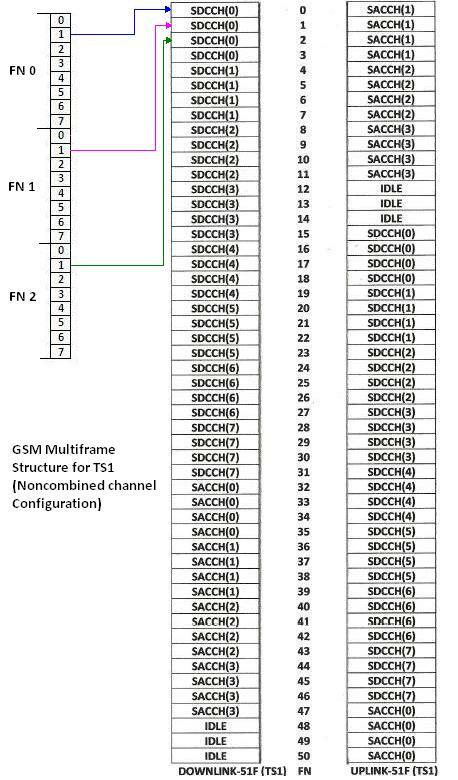 GSM Noncombined channel Configuration for TS0 is mentioned in below figure. As shown in the figure-1, BCCH/CCCH is mapped in TS0 and as shown in figure-2, SDCCH in TS1. A total of 8 users can share a time slot. Due to this it is called as SDCCH/8 combination. Here 8 designates that there are 8 total subchannels and each are used by 8 different SDCCH user. From figure-2 it depicts that there are 8 SDCCHs and 4 SACCHs in downlink multiframe. This is due to rate of SDCCH is twice that of SACCH channel. 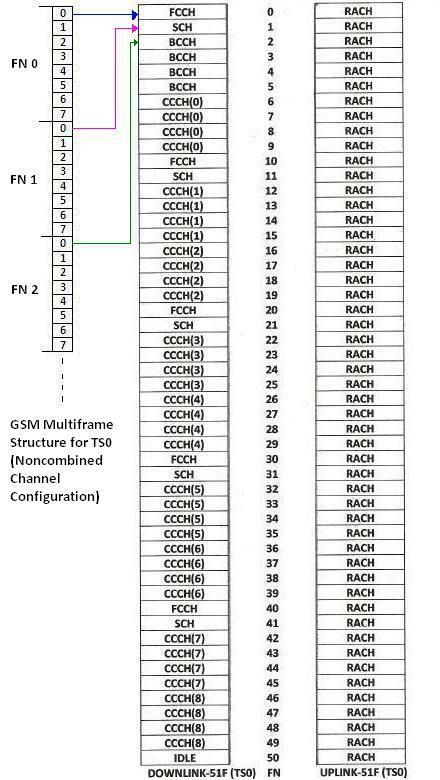 GSM Noncombined channel Configuration for TS1 is mentioned in the figure above.